You are currently browsing the tag archive for the ‘tree sit’ tag. In the fight against the proposed network of pipelines set to extend from Alberta’s Tar Sands, yesterday, the 19th, was chosen as a day of action against the Keystone XL pipeline by blockaders in Texas, occupying its path and disrupting construction for almost two months now (a Texas record, to be sure). It didn’t disappoint. Solidarity actions took place across the nation and beyond, and blockaders in Texas faced an ugly showdowns with police. 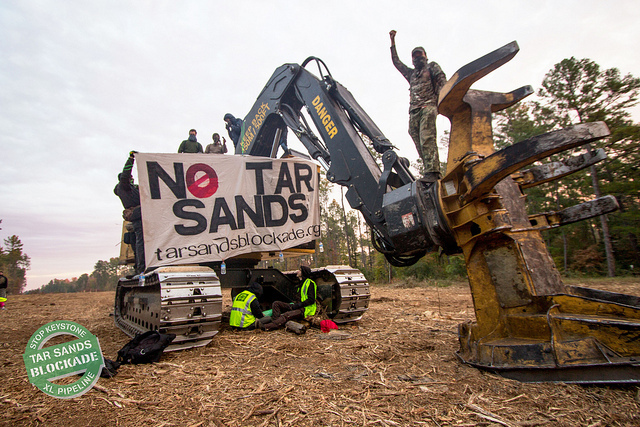 Actions in Texas began yesterday morning when blockaders established a second “tree blockade” along the proposed Keystone XL route, taking up positions by the Angelina river. In Nacogdoches, at least forty people stormed a construction site, chaining themselves to equipment with many more blocking access by forming human chains. Police soon arrived at both locations and ordered demonstrators to leave, then stepped in to make arrests when they didn’t. Pepper spray, cherry pickers and pain compliance holds were used to pry activists apart and away from equipment. Protesters remained nonviolent throughout. At least 11 arrests were made, including four ‘locked down’ to machinery and three tree climbers. Solidarity actions with the blockaders and others against the Tar Sands and associated pipelines took place across the continent and today even reached London, England. Sunday in Washington, around three thousand protesters converged on the White House to send a message to newly reelected President Obama regarding the Keystone XL pipeline, soon set to be reconsidered at the federal level. Yesterday at least 20 towns and cities held actions. Protesters in Houston, Texas held a teach-in outside the Valero oil refinery, which already processes (Venezuelan) bitumen. The Canadian embassy in Washington was stormed with a banner hung by Chesapeake Earth First, and our Consulate in San Francisco also saw a crowd of protesters. Other actions, ranging from rallies to banner drops and protests outside banks and gas stations took place in Bridgeport, Eugene, Seattle, Bloomington, Portland, Salt Lake City, St. Louis, Austin, Burlington (Vermont), Swathmore, Fairfax, Santa Clarita, Minneapolis, Palm Beach (with arrests) and others. In Canada, solidarity rallies took place at the Unis’tot’en blockade in British Columbia and Waterloo Ontario, and an anti-pipeline banner was hung in Coburg, Ontario. Here in Ontario, where resistance is focused on Enbridge’s Line 9 pipeline, activists from around the province met Saturday in Toronto to plan coordinated opposition. Judging from the number of forwards I’m now receiving, it seems safe to say that Hamilton is now far from alone in this fight. Tomorrow, our own council reconvenes on the issue with both sides sending delegations. While many of these actions were small, the fact that so many places were able to take part shows how widespread and coordinated opposition to the Tar Sands and these pipelines is becoming. People are now protesting Canada across the English-speaking world. Americans are storming our embassies, and Texan landowners are beginning to embrace tactics of West-coast forest defence. These actions, in turn, are only a some of the 40 cities which have seen climate-change protests in the past week or so alone. This is no longer just an issue for northern Albertans – this gigaproject has consequences literally which span the continent. Stopping it will require a grassroots network just as broad, something that’s now starting to come together. Solidarity to the blockaders and prisoners in Texas, Unis’tot’en, and everywhere else people are organizing and demonstrating against this ghastly gigaproject. Every community put at risk by these pipelines is another opportunity to shut them down – all we need to do is work together.